Spear-it Week at GW Fins! Invites You To A Truly Special Event! Have you ever heard of a chef placing an order with fishermen about what variety of fish they want to be caught? Well, the tide is turning and GW Fins’ Executive Chef Michael Nelson is at the forefront of this trend! Chef Michael has cultivated strong relationships with local fishermen who specialize in spearing their catch, and they actually call him before they go out on the water and ask him exactly what varieties of fish he’d like them to spear and then bring their catch to GW Fins the next day! “This is the ultimate way to source seafood for our guests,” Nelson reflects. To highlight this new way of sourcing seafood, we are inviting you to be a part of a very special event! GW Fins will be hosting a “Spear-It Week” from October 21st through the 27th, showcasing fish that have been speared specifically for you, as well as the fishermen who have speared them! The highlight of this week will be two exclusive, educational dinners where Chef Michael will serve a variety of fish including Cobia, Barracuda, Tuna, Lionfish, and Snapper. 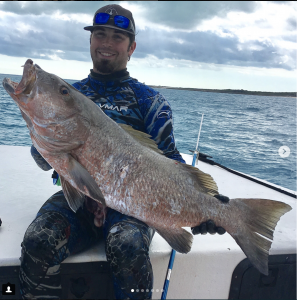 Sourcing through spearfishing dovetails perfectly with the larger picture of sustainability that Nelson has championed for several years at GW Fins. There is zero by-catch during spearfishing, one of the leading causes of waste in the seafood industry. Join us on Tuesday, October 23rd or Wednesday, October 24th at 6:30 pm for a five-course dinner showcasing fish that have been specifically speared for you. The two fishermen who will spear the fish, Tyler Mcdonald and Ronnie Collins, will be present, discussing how they target and obtain their catch while sharing some photos and video of their spearfishing adventures. The cost for this unique five-course dinner showcasing the future of seafood sourcing is $125 (inclusive of tax and gratuity). Seating is extremely limited and reservations can be made by phoning the restaurant at 504.581.3467.